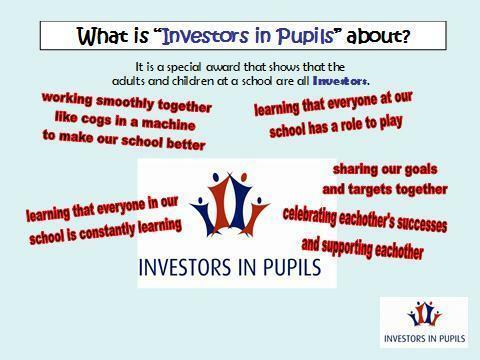 Investors in Pupils is an award set up to celebrate and acknowledge schools who ensure that they include children in the decision making process across all areas of school life. This includes having a School Council, helping children understand the roles of stakeholders in their education, understanding about the school budget, being more involved in assemblies, having personal goals to work towards, having a support system set up for new members of the school, in addition to many other areas. At the end of the day, it is about celebrating the voice of the children and letting them show how responsible they can be when given the opportunity to shine. We have created a Class Induction book in each class to inform new members of our school about what occurs on a daily basis, what makes each class unique and it also includes bi-weekly reports on what each class has been up to - as reported by the children - so that new pupils can quickly catch up! 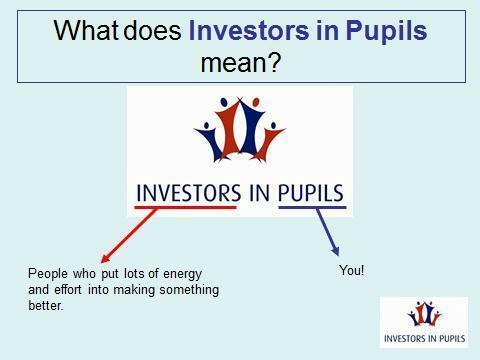 This is also helpful for trainee teachers too! Our School Superheroes are all of the people, in school, who ensure that the children of Ripponden J&I are getting the best education possible. To understand these roles, each class has been assigned a stakeholder: from the SLT, to our brilliant kitchen and midday staff, to our premises staff, TAs, Governors, Teachers, Office Staff, etc. Then each class presented what they had found out about the roles and how it impacted on them and their education. This was achieved through whole-school assemblies and the children did a fantastic job informing the rest of the school! Each class has also created a motto that is unique and represents that class. In addition to this, each class has a target to work towards too. This is updated regularly as targets are met! Our wonderful school council works brilliantly at representing their class in whole-school decisions. They meet regularly and take questions back to their classroom to take feedback from their classmates. Classroom and whole-school jobs are available to every child in the school. This gives children opportunities to have further responsibility and contribute to the day to day running of the school. Each pupil in the school has created a personal goal, one that is different from their academic goals. This is displayed in the classroom, but in an anonymous fashion so that the child's goal is only known to the child and the teacher or supporting adult. Some classes have chosen to have the child create a logo that represents him/her, with their target displayed on the opposite side, facing the wall. These goals are discussed regularly and updated when met. Class 5 worked hard during the Summer Term to earn enough credits to ensure that they have the equipment required for lessons in Year 6. Through the introduction of a Classroom Economy, the children use a credit and debit book to track their 'earnings'. Credits are given out for effort, following class/school rules, super answers, helping one another, completing homework, etc. Debits are given out less frequently, but may be incurred when not following a class/school rule. The children have been provided with a real-world price list of the supplies that they will be required to have in Year 6, so they have a goal to work towards when the classroom store will open at the end of the term and they can spend their credits on the required items. The aim of this exercise to encourage the children to have a better understanding of the cost of supplies in school, so that they will appreciate and respect the resources in the future.